The newly formed Technical Committee started negotiations with Woodspring District Council and in 1981 a five-year lease was taken out under the auspices of The Clevedon Pier Preservation Trust whose energetic Chairman, Tony Wring, was a key figure. Negotiations took place with the National Heritage Memorial Fund in order to secure grants for the restoration of the pier. On one occasion Mike Allman and Niall Philips from the Trust took a model of the pier to a meeting at The National Heritage Memorial Fund offices in London. The model, which was in a heavy 1.8m long glass case, got stuck in the lift. A very helpful gentleman who later turned out to be the Chairman of the Fund helped Mike and Niall to disentangle the model. With the Lottery Fund on board a full design for the necessary repairs to the Pier were drawn up by Consulting Engineers Roughton and Fenton. With confidence in the Trust’s ability to rebuild the pier was growing and a 99-year full repairing lease was taken out with Woodspring District Council on 1st April 1985. Initially grants of £500k from the Manpower Services Commission and English Heritage funded a contract to dismantle and remove the cast iron pier head buildings and shelters. This work was undertaken by Dorothea Restoration using Government subsidised job creation labour. The contract included the refurbishment of the Toll House. The frames of the Pier Head pavilions were partially re-erected and stored in what was then the Hawthorns Car Park. The main contract to restore the pier was awarded to John Howard of Chatham, renowned international civil engineering Contractors whose previous projects included the construction of elements of the Severn Bridge, Humber Bridge and Forth Road Bridge. Work started in February 1985. The original plan was for the pier to be repaired in situ, but John Howard offered an alternative proposal which involved dismantling the pier and taking it to the redundant Albright and Wilson dock in Portishead where repairs would be carried out. It was thought that the work would progress more rapidly in a controlled environment. The pier was broken down into large pieces and towed on barges up the Severn. A familiar sight in Clevedon Bay in 1985 was a large flat barge with a big blue crane on it rising and falling with the tide and regularly sitting on the seabed at low tide. New foundations were installed and repair work started. Regrettably due to problems with overseas work John Howard went into liquidation in September 1986 and Clevedon was left with no pier and no contractor. This was a time of much head scratching! Whilst negotiations were continuing the Trust directly engaged the Steelwork subcontract fabricator Sheppard Engineering to continue to do the repairs in Portishead. New Contract Documents were drawn up and in 1988 Ernest Ireland (part of Mowlem) with sub contractors Christiani and Nielsen were appointed to complete the repairs and reinstate the pier. This was major undertaking was carried out over the summer of 1988 using something that resembled an oil exploration platform. This ‘jack-up barge’ with a large crane on it was floated into position and then its legs were ‘jacked down’ onto the seabed and the working platform lifted above the water level. The main pier promenade structure was completed by October that year with a celebratory firework display to mark its completion. 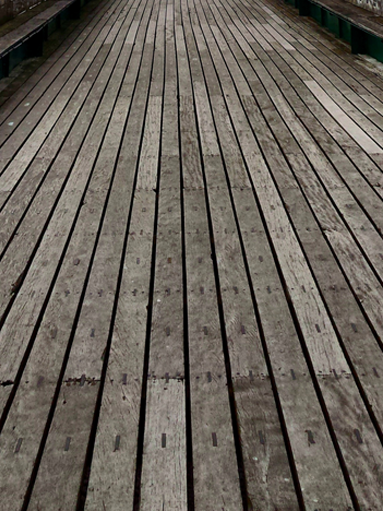 A separate contract was awarded early in 1989 to put decking onto the pier promenade. This was completed with a temporary access across the pier head to enable ships to call at the pier and a grand reopening was held on 27th May Bank Holiday 1989 with sailings aboard the paddle steamer Waverley from Clevedon throughout the day. 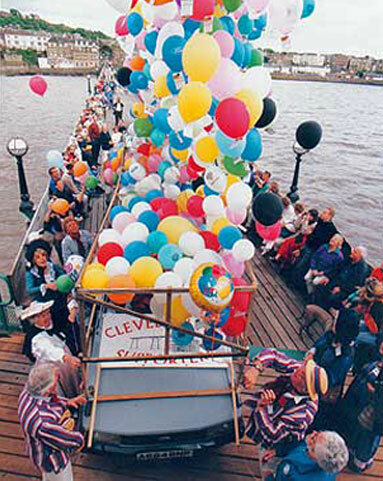 It had been 19 years since the last sailings and the town celebrated in style with a Victorian themed party along the full length of the beachfront with the Clevedon Pier Supporters Club playing a characteristically active role. The grants and funds raised to rebuild the main spans of the pier amounted to £2.2m. A period of national recession affected progress during the final stage of the restoration and fundraising in the early1990s. In 1993 the Hawthorns Car Park was sold in order to build a Retirement Home and the Pier Head buildings had to be moved to a new site in the Pier Master’s farmyard. Volunteers temporarily erected one of the original shelters across the entrance to the pier to celebrate the 100th anniversary of the reopening of the Pier Head. to change this text. Volunteers, led by Mike Crisp a retired Concorde design engineer, restored the remaining lamp standards and re-erected them down the left side of the pier in 1994. They then went on to get replicas to fill the gaps and to cover the right side of the pier. Cerdic foundries in Chard made these and the volunteers installed them in early 1996. On account of limited funds being available the volunteers made the lamp enclosures using hanging basket frames, which proved to be in keeping with the architecture of the pier. In 1995 plans were at last drawn up for the final stage of the pier restoration being the reinstatement of the Pier Head decking and buildings and the repairs to the concrete landing stage. In September 1995 the Trust were delighted that the newly formed Heritage Lottery Fund awarded a grant towards the project and plans could get underway. Peter Ware, a renowned local architect, was appointed to determine the approach to the restoration of the buildings. He measured the existing component parts and referenced archive photographs in order to prepare outline drawings of the buildings. This was an almost impossible task that became a complex jigsaw puzzle, with little information and a large pile of rusty metalwork in a farmyard. All the reusable bits were identified and castings made for replacement parts. 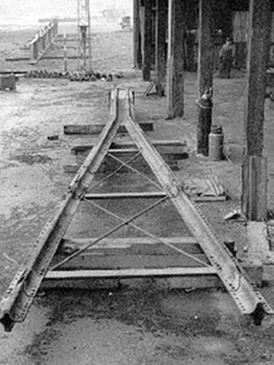 One remaining lamp standard for the pier head formed the basis for new standards to be cast. The colour scheme was devised based upon research to be sympathetic to the late Victorian design of the buildings. The 1913 concrete landing stage had suffered years of neglect with several of the legs having become detached below lowest water level with the result that the landing stage felt distinctly mobile when the ship came alongside in strong seas. Teams of divers repaired the concrete in zero visibility. The total cost of the pier head restoration was £2m. The pier remained open to the public throughout the works and the summer season of sailings continued uninterrupted. A grand reopening on the late May Bank Holiday by David Bryant and Sir Charles Elton on 25th May 1998 marked the completion of the restoration. Through a combination of vocal local support, heritage engineering expertise and lottery funding the pier had been saved for future generations. The pier had at last been restored to its true glory and was voted Pier of the Year in 1999 by the National Piers Society. This honour was repeated in 2013 after the pier promenade had its first full repainting and repairs at a cost of £795,000 twenty four years after it had been restored. Repainting of the structure of the Pier Head had been carried out in 2005 for £398,000. The pier’s status as an icon of national importance was acknowledged by the awarding of Grade 1 listed status in 2001. The only Grade 1 listed pier in England in tact, the only other grade 1 listed Pier is Brighton West Pier which has almost totally disappeared after a sad catalogue of decay, fires and storms.